I possess a beautiful leather-bound edition of the Picatrix by Ouroboros Press in Seattle. My friend Richard Brzustowicz is credited in the acknowledgements, and this makes me unreasonably happy. However … the background to the translation is a mystery to me. I know nothing about the history of the texts used in the translation, or the antecedents of the translator. It just … popped out of thin air. I am grateful to have it, but I would like to know more about it. With that in mind, I was comparing it to another edition, that of John Michael Greer and Christopher Warnock. 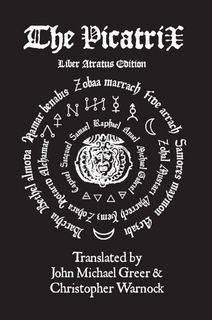 This would appear to be from a Latin edition, one of many that influenced Renaissance Hermeticism. Unfortunately I am unable to access the Translators Notes without purchasing the book, and my library is saying “No, no, it’s too big, it won’t fit!”. I observe that most of the protestation is coming from Agrippa’s Four Books in the Tyson edition, a case of the pot calling the kettle black … or B&W as the case may be. I may purchase it in any case, but, but, something else happened. I found David Pingree’s definitive Latin edition at the Warburg. Now that has all the scholarly apparatus and then some. Just for fun I was cutting and pasting passages into Google translate. You can do this – medieval dog-latin into vaguely Hermetic nonsense. It’s like an automated version of barbarous tongues (aka, the goetia). It’s fun. You should try it.